In a triumphant turn of events last month, voters elected Democrat Doug Jones to the U.S. Senate seat in Alabama over accused sexual predator and known homophobe Roy Moore. Shortly after the win, Jones’s son — Carson Jones — who at the time said he “couldn’t be prouder” of his dad, confirmed to The Advocate that he's gay. 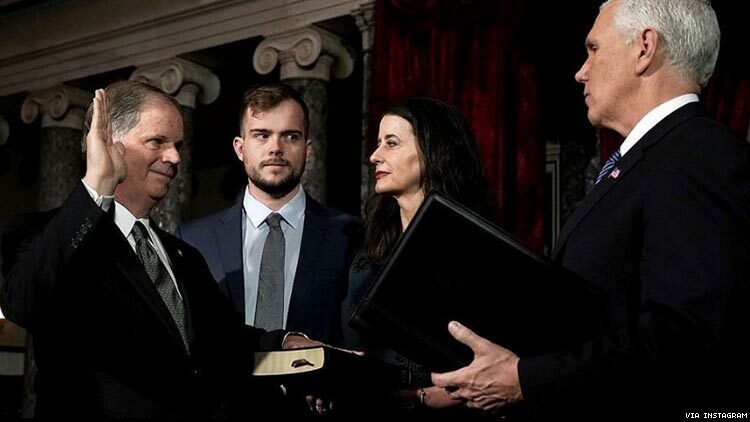 On Wednesday [Jan 3, 2017], Carson Jones stood side-by-side with his dad as his father took the Senate oath of office, administered by virulently homophobic VP Mike Pence. Shortly after, Carson Jones, who goes by TheDapperZookeeper on his Instagram page — which includes celebratory photos of the day his father won the election, Pride photos, and a picture of him meeting Lance Bass at a gay bar — posted a photo at the oath-taking in which he appears to be staring pointedly at Pence. As governor of Indiana, Pence signed a “license to discriminate” law (later amended), which would have allowed businesses to refuse service to LGBT people, and pushed for his state to amend its constitution to ban marriage equality. if looks could kill...what a handsome young man. I love the look on Carson's face. And I bet Mike Pence secretly does, too.